Our penultimate stop was the place I most wished we could have spent more time. Of course, that just gives me a reason to return to Vienna. 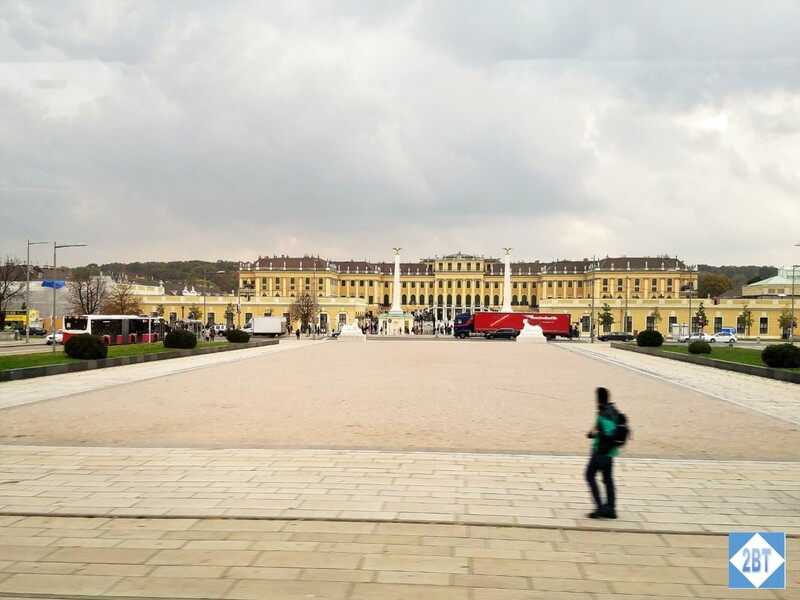 Included with our trip was a morning tour of the city and the afternoon brought optional excursions to the Schönbrunn Palace, the Fine Arts Museum or accompanying the chef, Marcus, to the Farmer’s Market. 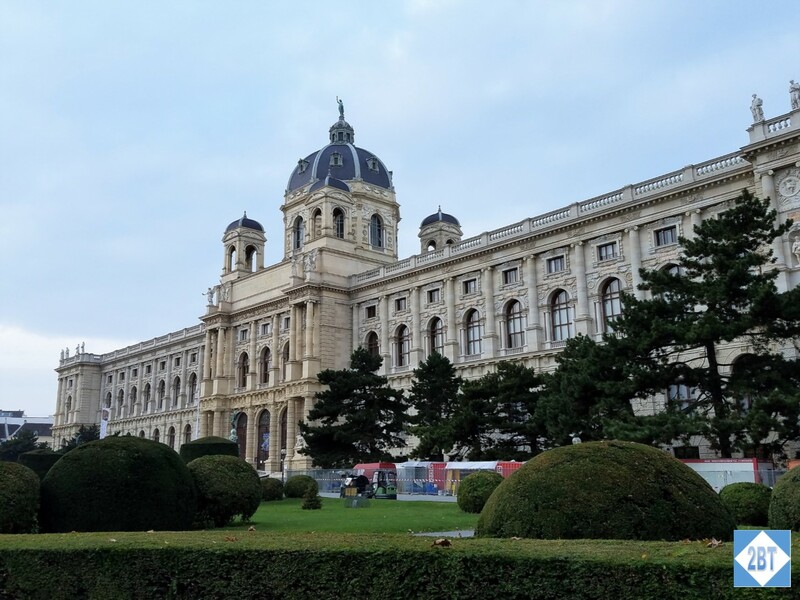 The first part of our tour was a motorcoach ride along the Ringstraße, the boulevard that encircles the city, and gaze at the gorgeous architecture. From our bus windows we viewed many of the city’s famous buildings, like the Opera House and the Parliament building. 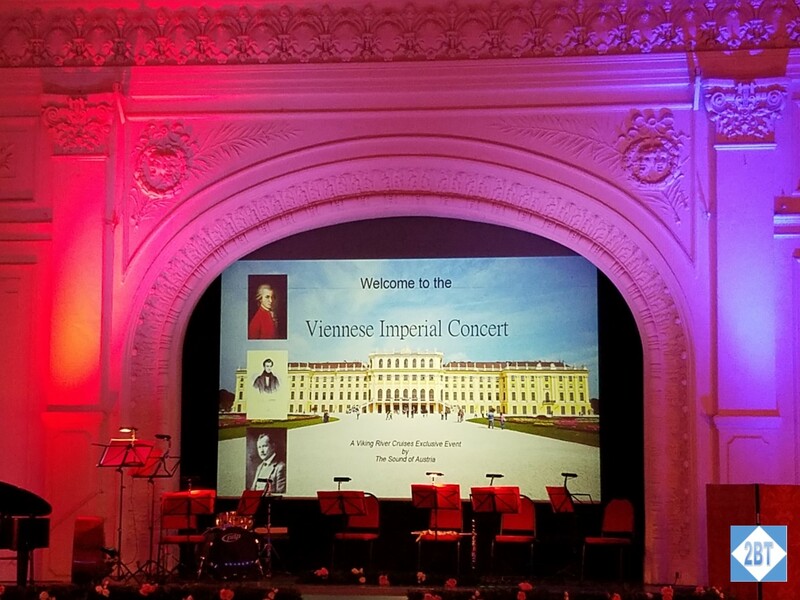 We also cruised by the Hotel Imperial, the grande dame of hotels in Vienna. Its presidential suite is typically the home of visiting US Presidents. However, in 2006 the Rolling Stones had that suite booked so when George W. Bush came to visit, he had to stay elsewhere! 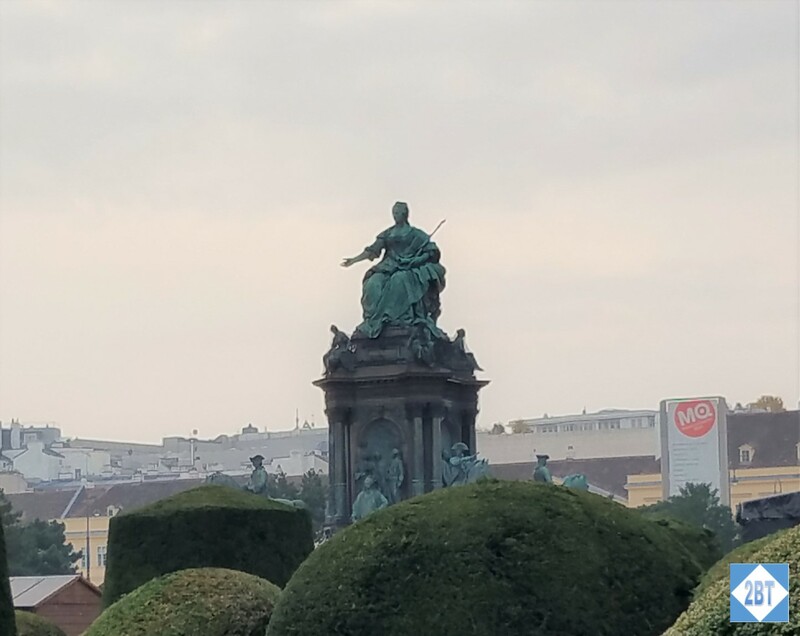 We eventually stopped at Maria-Theresien-Platz, named in honor of Maria Theresa, who was the last of the Austrian Habsburg line. Though she died in 1780, her influence is still widely felt. She reigned for 40 years and was the ruler of 10 regions on her own and by marriage was the Holy Roman Empress. Naturally there was a statue of her at her namesake plaza. On either side of the plaza are the Natural History Museum and the Art History Museum. The buildings appear to be nearly identical. 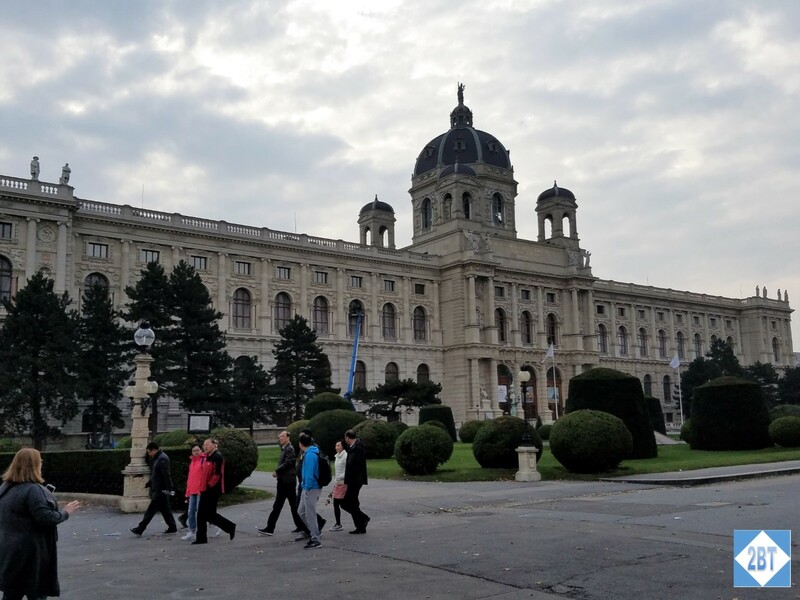 What distinguishes them are the type of statuary on their facades: the Art History Museum has statues of European artists while the Natural History Museum’s statues are of people from Africa, Asia, Europe and the Americas. 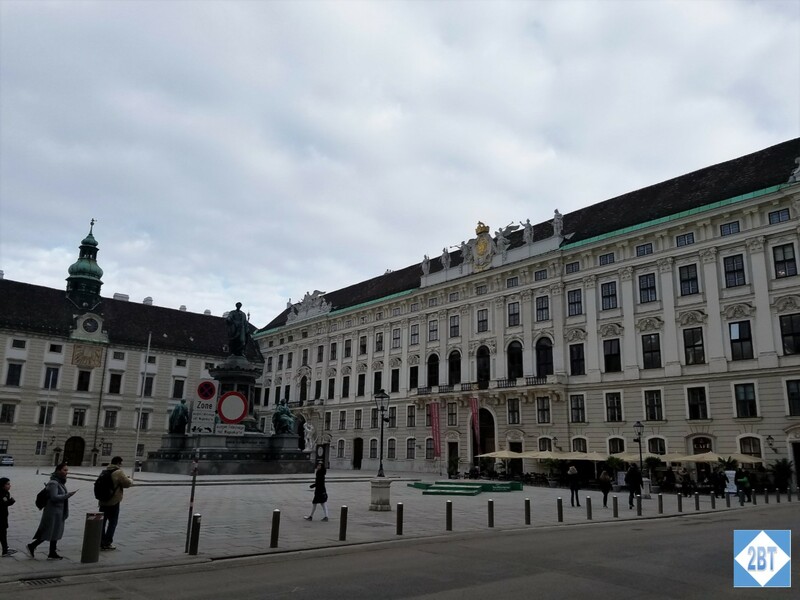 Across the street from this plaza we walked through the free-standing gate where the outer walls of the Hofburg Palace once stood. 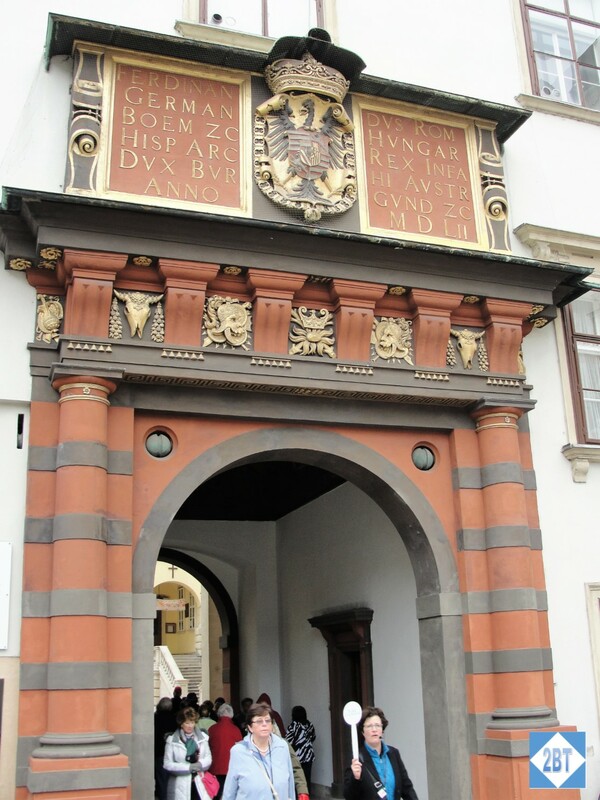 The Äußeres Burgtor commemorates the Battle of Leipsig in 1813, when Austria defeated Napoleon. 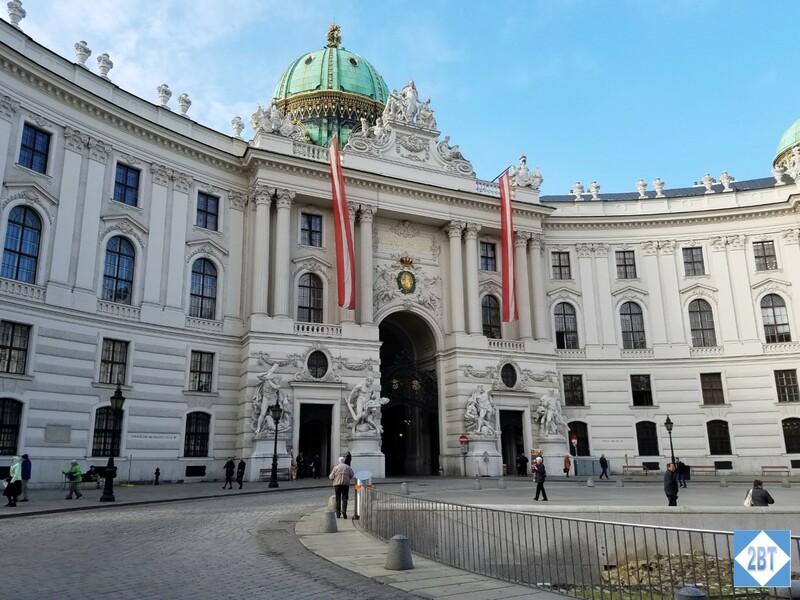 Once through its archways we arrived in Heidenplatz (Heroes’ Square), a large plaza just in front of the Neue Burg (New Wing) of the Hofburg Palace. 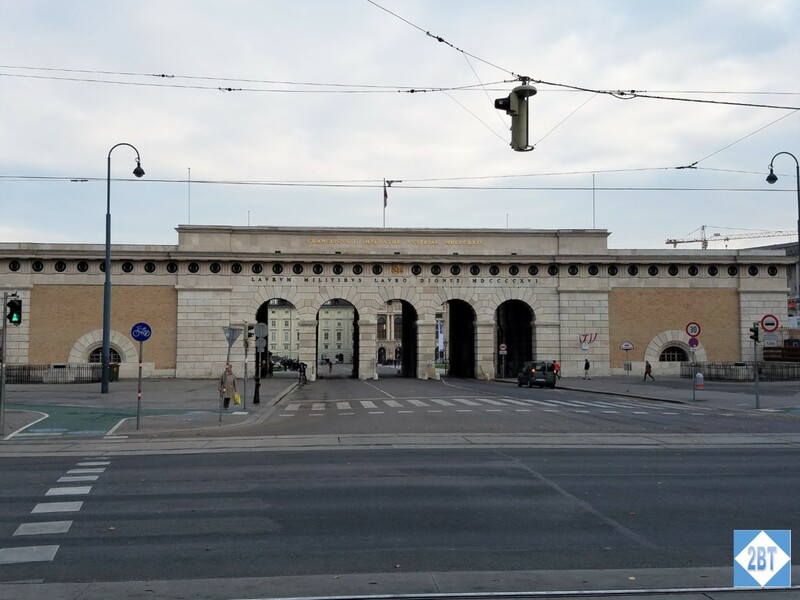 This was the location where, in 1938, Hitler announced that Austria had been annexed to Nazi Germany. 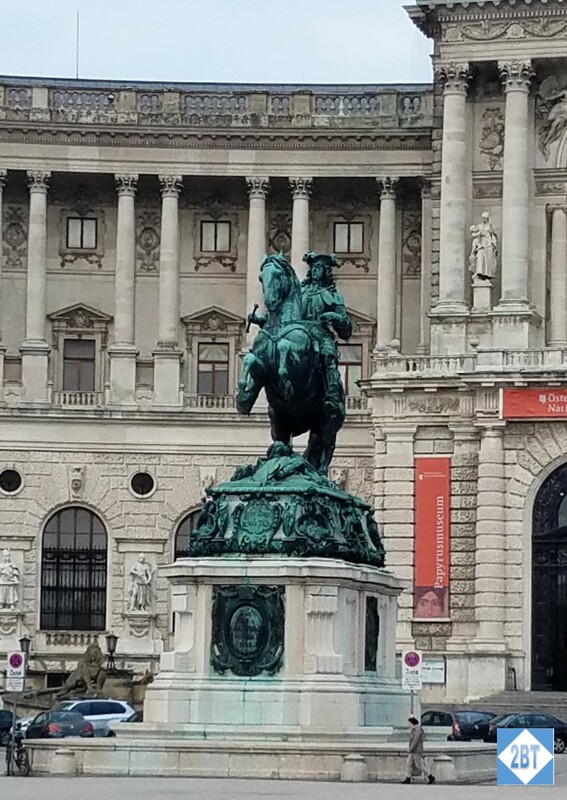 In front of the palace is a statue to Prince Eugene of Savoy, one of the most successful commanders in modern European history. A Frenchman by birth, his poor physique and a scandal involving his mother caused King Louis XIV to reject him for France’s military. He promptly offered his services to the Habsburgs in Vienna. His career spanned six decades and he served three Holy Roman Emperors. 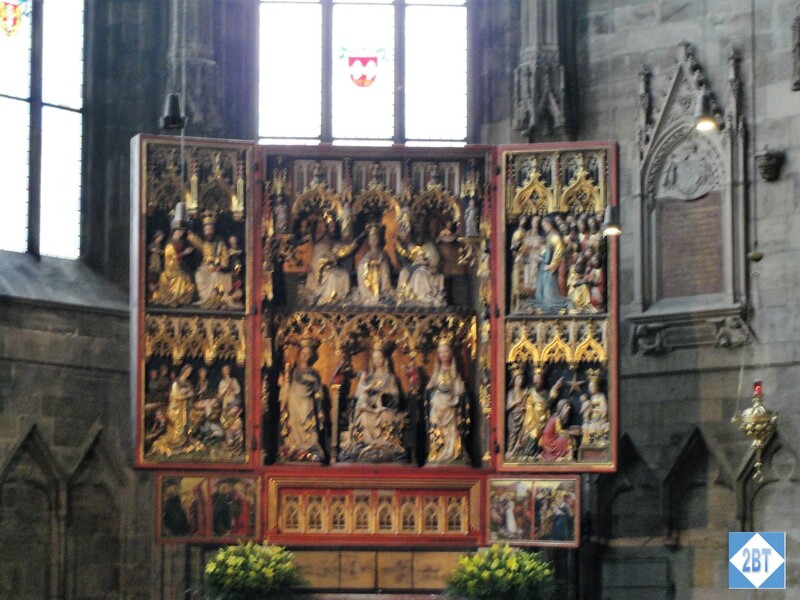 His remains – except for his heart which lies with his family in Turin, Italy – are in St. Stephen’s Cathedral. 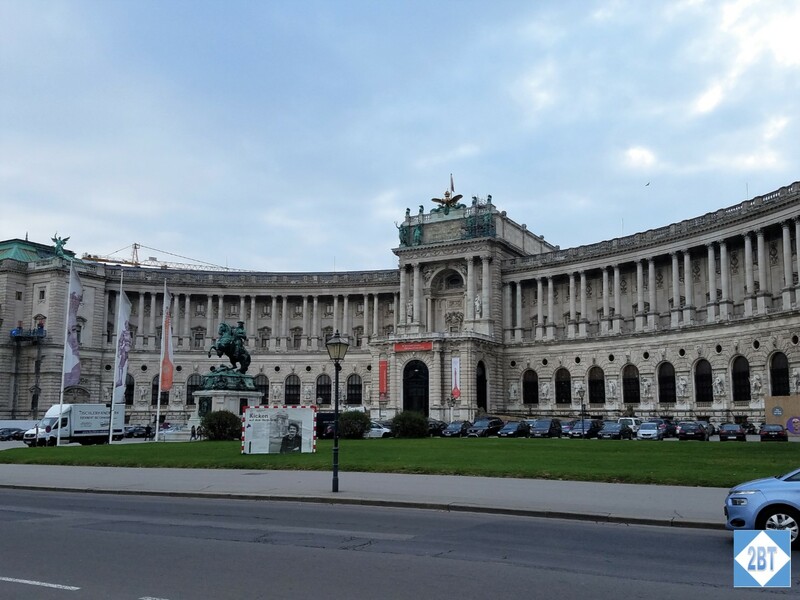 The Hofburg Palace is absolutely huge with some sections dating back to the 13th century. 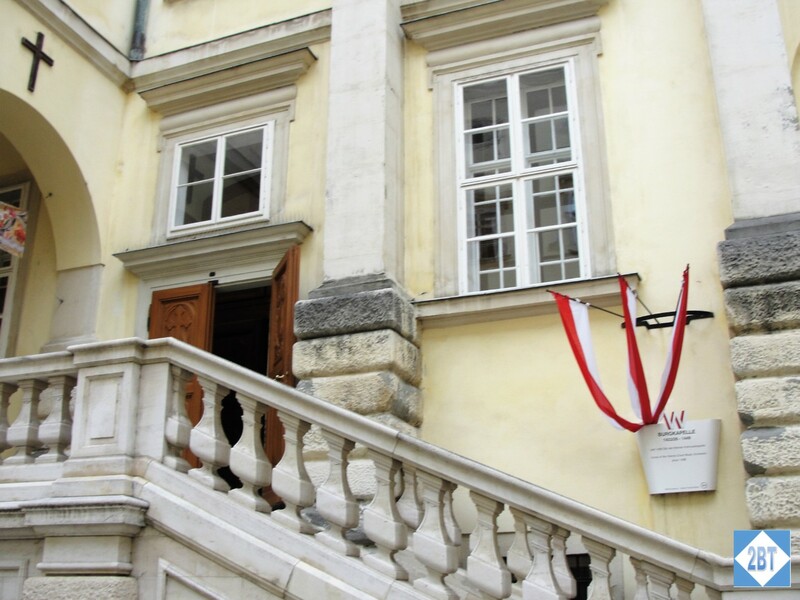 Today it’s the official residence and workplace of the President of Austria. 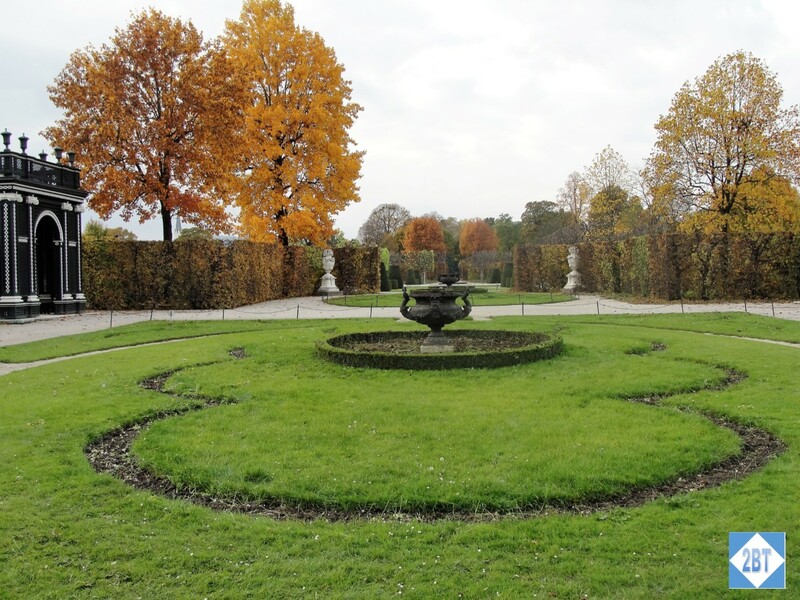 When it became the official seat of government in 1279, it was the winter residence with nearby Schönbrunn Palace as the summer residence. There are at least seven wings, the imperial mews, the court theater and the imperial chapel. We came across this interesting-looking archway and our guide led us through it. 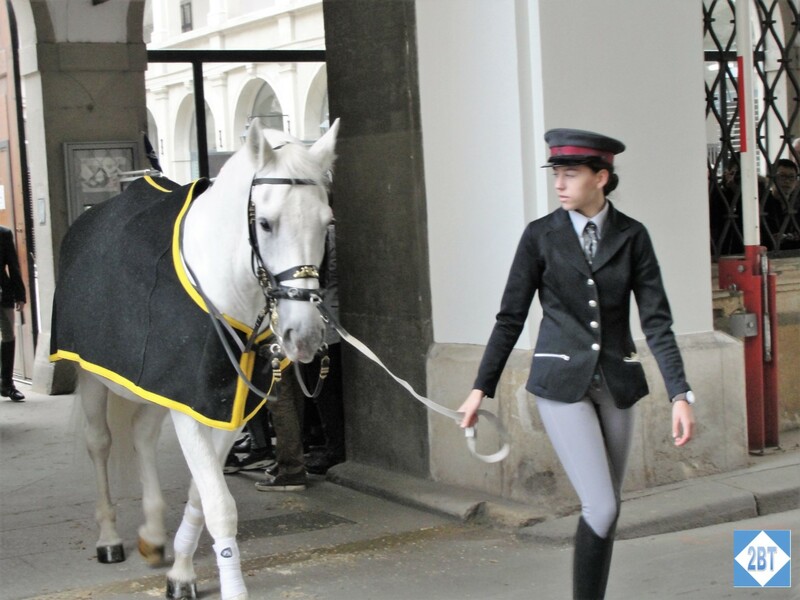 I had completely forgotten that Vienna was the home of the Spanish Riding School, known for the Lipizzaner stallions. I had not seen these magnificent horses since I was a child so I was extra-thrilled when I realized our guide had timed it so that we were there as the stallions were led from their stables across our walkway into their practice arena. They are just so beautiful! We also passed by this unassuming door which leads to a chapel. 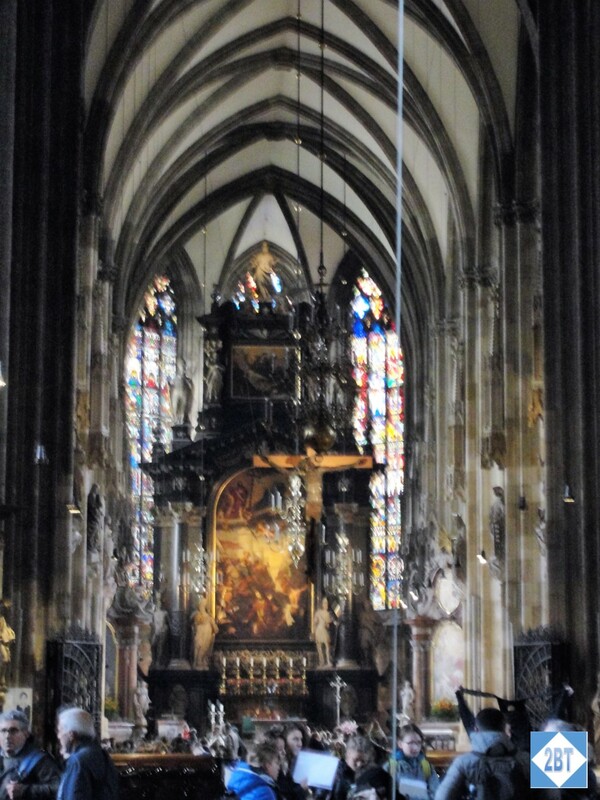 But not just any chapel – this is the Court Chapel where the Vienna Boys’ Choir sings. 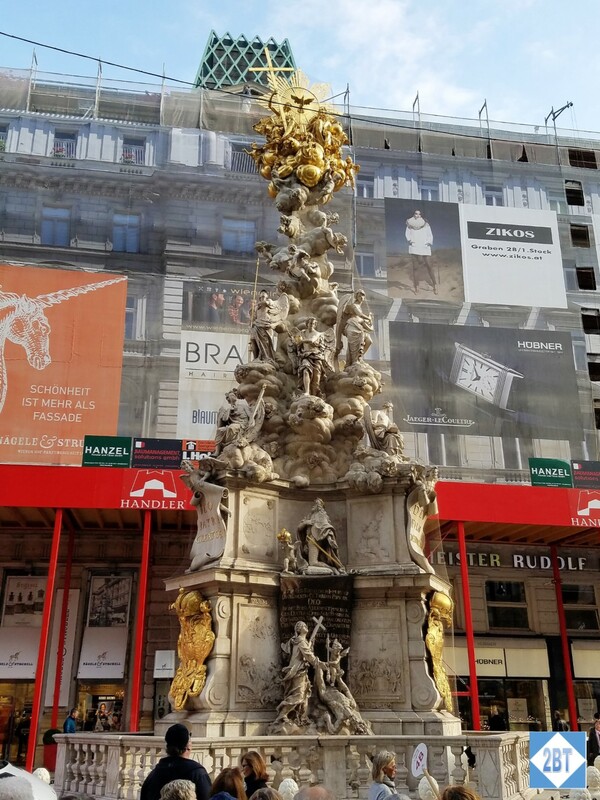 After leaving the palace, we walked through the Kohlmarkt, one of the world’s most expensive shopping districts. While we saw stores from Tiffany & Co., Salvatore Ferragamo and Gucci, I did not think they were worthy of photos. But maybe that’s just me. Of more interest to me was this sculpture called Pestsäule (The Plague Column). It was built to commemorate the victims of the plague of 1679. Finally our tour ended in Stephansplatz, the plaza that is home to St. Stephen’s Cathedral. While various churches have existed on this site since 1137, the current style is both Romanesque and Gothic. The 446-foot South Tower is in the Gothic style and there was to be an equivalent tower on the North side but its design was too ambitious and it was capped at roughly half the height of the South Tower in 1578. I loved the roof with its green and gold-tiled design. 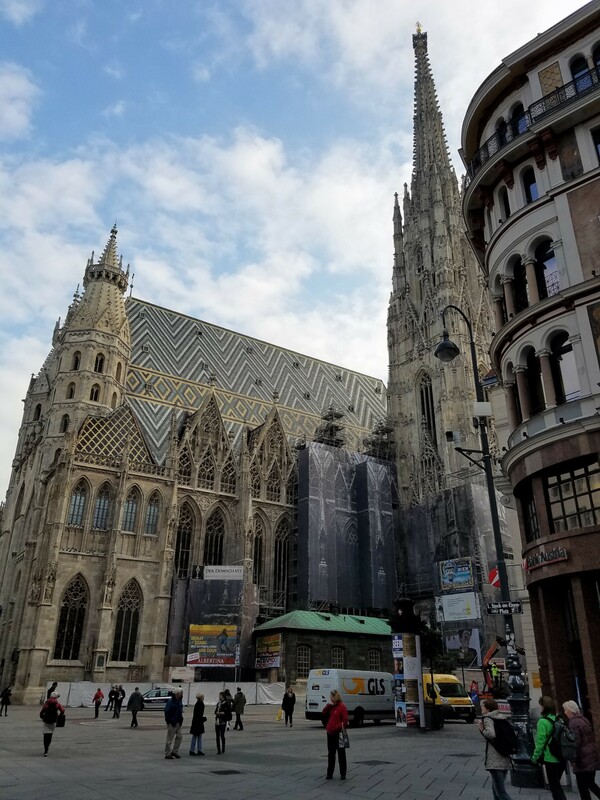 There are 230,000 of those tiles and on one side of the roof (naturally it was not the side I photographed) it includes a mosaic of the double-headed eagle that was the symbol of the Habsburg empire. Inside the church are the remains of 72 members of the Habsburg Dynasty, Prince Eugene of Savoy and Frederick III, Holy Roman Emperor. It has been host to both the wedding and funeral of Mozart and the funerals of Antonio Vivaldi and former presidents of Austria. Something that had not occurred to me until I started reading about the church upon my return was that, unsurprisingly, there was no HVAC system so the building was heated by braziers until the early 2000s when a heating system was installed. But even now it can only warm the old stone building up to about 50 degrees Fahrenheit! 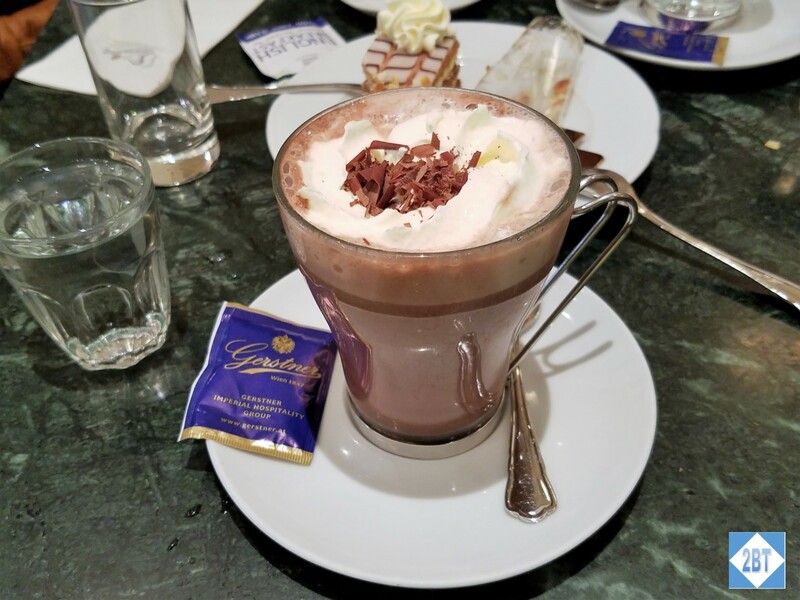 Since we were in Vienna we just had to stop in a café. It would have been more classic if we’d stopped for a coffee but since neither of us drink coffee, we “settled” for some hot chocolate. So yummy! 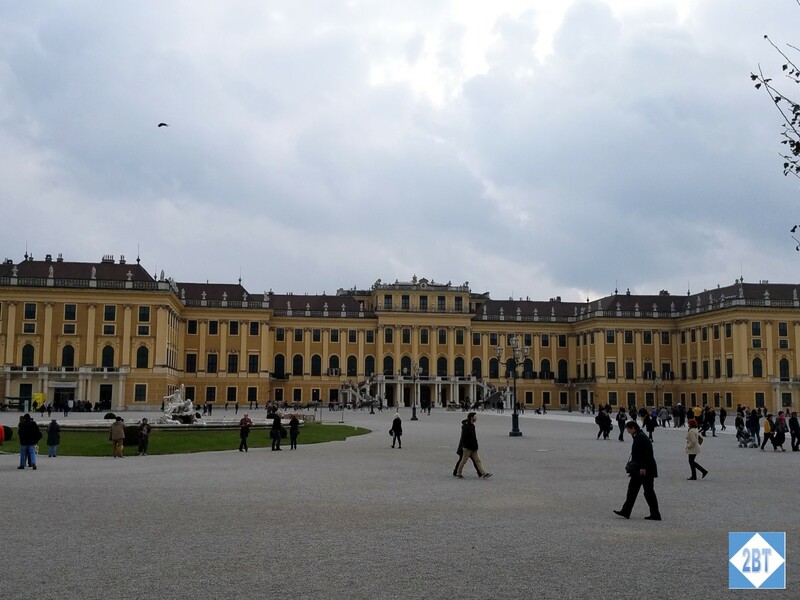 After lunch several of us took an optional tour to Schönbrunn Palace, the summer home of Maria-Theresa and her family. 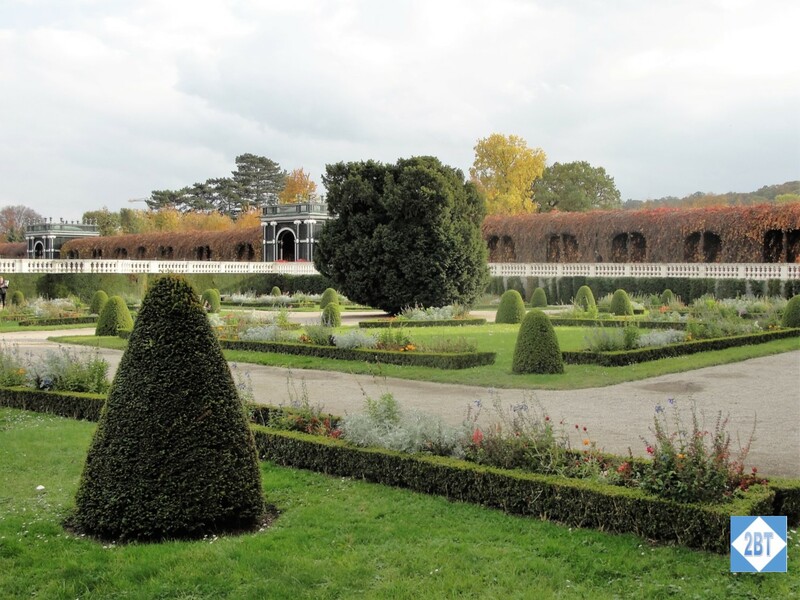 She received the palace as a wedding gift from her father and spent two decades enlarging it. It’s a tiny little thing, only 1441 rooms. (!) It was named a UNESCO World Heritage Site in 1996. Sadly we weren’t allowed to take photos inside. It’s probably just as well because it would have taken several more hours to wend our way through it if we had stopped to photograph everything that was interesting! Behind the palace are the green spaces that today are public parks. There were a number of folks passing through on their way home after work and others who were jogging along the paths. 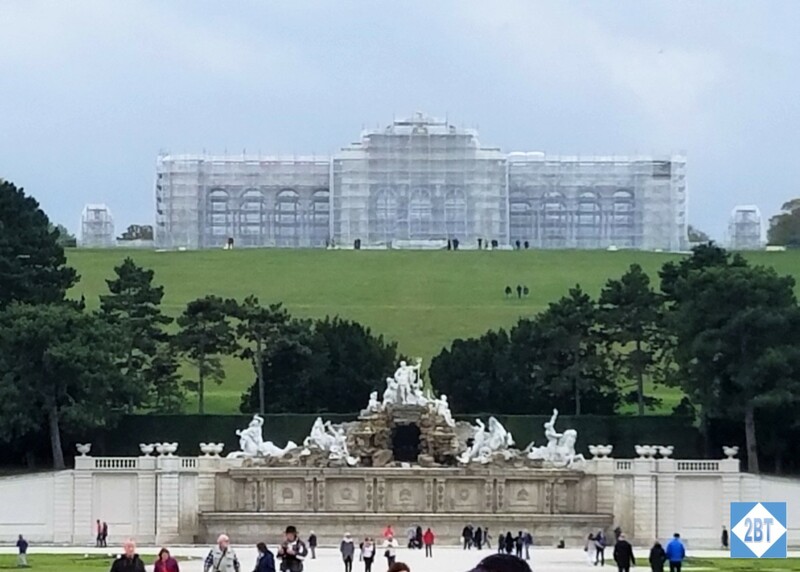 There’s a large fountain featuring Neptune and behind that, up on a hill is a building called the Gloriette. 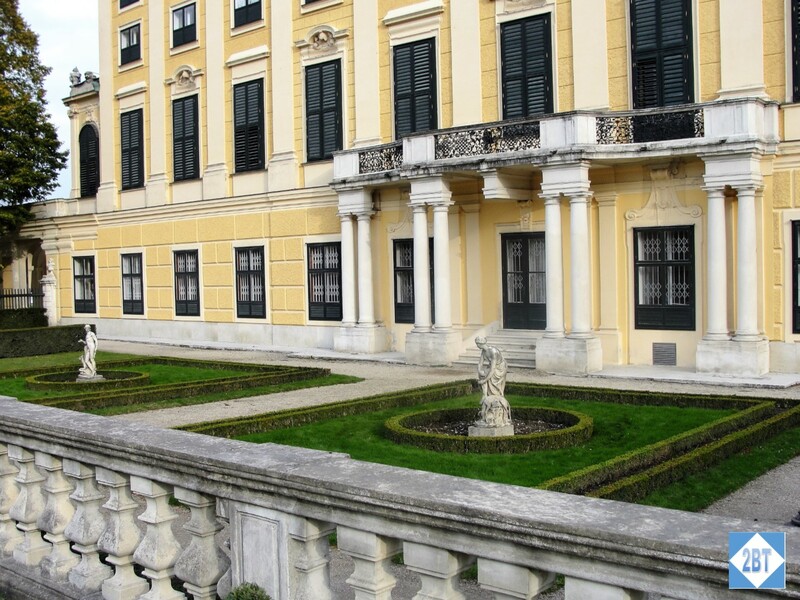 Maria-Theresa had it built to glorify Habsburg power. 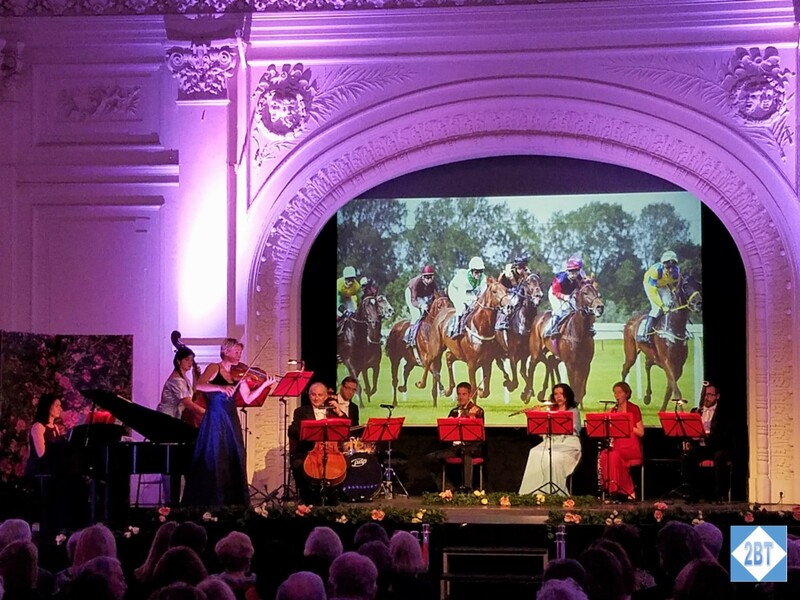 In a city where Mozart and Strauss were thought of so highly, some of us couldn’t pass up the opportunity to go to a concert featuring their music. I was disappointed when I realized we would not get to visit one of the famous local venues but Viking has rented a ballroom and set up seating for guests from two longships, so it was our own private showing! The master of ceremonies/baritone was named Seth and was from somewhere in North America. I believe the other three singers were from Russia but their English was quite good. There were also a couple of Russian dancers as well as a number of excellent musicians. We had a terrific time and at intermission the singers mingled with the audience. 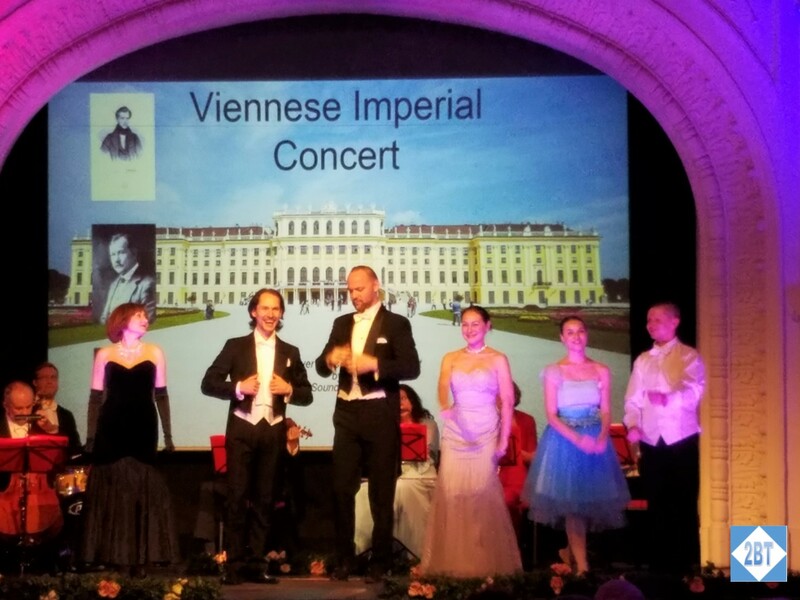 And of course, the concert ended with the Blue Danube Waltz. We were encouraged to dance and the singers even came out and danced with us. All in all it was a delightful evening. My only complaint about our visit to Vienna? It was too short! It is definitely on my “must re-visit” list. After boarding the longship we learned that we were going to be late getting into our final port, Budapest. But not to worry, Viking had a plan. (Of course they did!) In the morning we’d stop at a little port out in the middle of nowhere and board motorcoaches that would take us into the city. We’d be a little later than planned but we would still arrive in time to get our morning city tour and by the time it was complete, our longship would be docked. I was a little disappointed because I’d heard that sailing into Budapest was a glorious sight to see but there was no choice and I knew Viking would take care of us. You know the saying about the best laid plans of mice and men? Yeah, that.